Cheney Reservoir, located on the North Fork Ninnescah River in south-central Kansas, is the primary water supply for the city of Wichita and an important recreational resource. Concerns about taste-and-odor occurrences in Cheney Reservoir have drawn attention to potential pollutants, including total phosphorus (TP) and total suspended solids (TSS). July 2009 was the 15th anniversary of the establishment of the Cheney Reservoir Watershed pollution management plan. The U.S. Geological Survey (USGS), in cooperation with the city of Wichita, has collected water-quality data in the basin since 1996, and has monitored water quality continuously on the North Fork Ninnescah River since 1998. 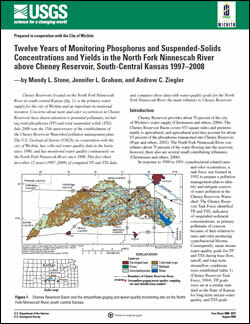 This fact sheet describes 12 years (1997–2008) of computed TP and TSS data and compares these data with water-quality goals for the North Fork Ninnescah River, the main tributary to Cheney Reservoir. Stone, M.L., Graham, J.L. and Ziegler, A.C., 2009, Twelve years of monitoring phosphorus and suspended-solids concentrations and yields in the North Fork Ninnescah River above Cheney Reservoir, South-Central Kansas 1997–2008: U.S. Geological Survey Fact Sheet 2009–3073, 4 p.